Designed specifically to conform to any Weaver or 1913 Picatinny Rail / Mount on the planet. We offer these RINGS in Pairs & Individual. This page is for TWO (2) Rings / 1 - Pair. These rings are specifically designed to be used on any high end sniper, target or hunting scopes.. Super Heavy Duty for GREATER STABILITY! 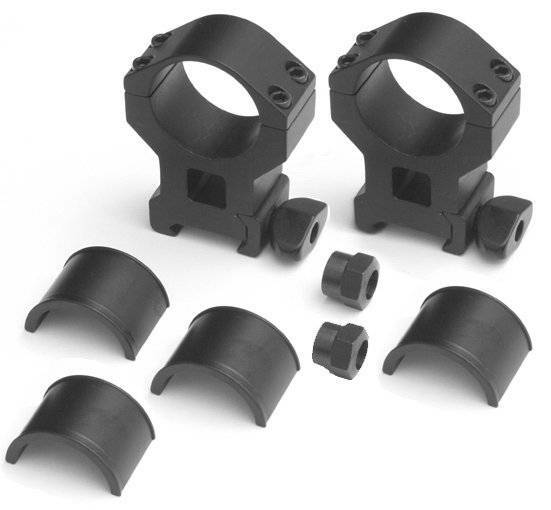 You would only need (1) of these for an Aim Point but, if you are using these for conventional style scopes you would need (2) rings. Narrow Width: We make these in a narrow width to give the end user GREATER mobilaty to position the scope backwards or forwards. Wider rings often take up too much space on the scope tube which LIMITS the shooter's abilaty to adjust the scope for a correct and more confortable Eye Relief. Height / Rise: Single Sniper Standard Duty Ring is available in 39mm rise. This means that from the top of the rail / flat top / scope mount surface to the center of the 30mm diameter is 39mm. Co-Witnessing: Meaning using in conjunction with another weapons site (iron sights) or night vision. The Single Sniper Standard Duty Tall Ring 39mm rise will co-witness with GG&G high 6015 NV mount. The Single Sniper Standard Duty Tall Ring 39mm rise will co-witness AR15 Iron Sights with an Aimpoint ML-2 (or other models) to place the red dot directly on top of the M16/AR15 front site post. Every staff member at MFI shoots on a daily basis. We have these rings on many of our weapons that we test. Just a super quality ring at a very reasonable price. 30mm Diameter but, also comes with 1" inserts for 1" diameter optics. Narrow / Overall Length / Thickness: Single Sniper Heavy Duty Ring @ 0.810 inch / 20.5 mm. Wide with two bolts on each side. Bolts and Cross over Lock Downs are Weapons Grade Steel. Fast & Easy ON and OFF. Wing Nuts and Standard Aim Point Style Locking Nuts. The above photo shows the MFI PROTOTYPE of the 14 inch long HK Low Profile Scope Mount on a PTR-91 with US Optics Sniper Scope and PVS-22 Night Vision Scope. This is to clearly demonstrate that the MFI Tall Sniper Ring (as well as the MFI Cantilever Ring with 39mm rise) is an exact match in height with the PVS-22 and thus the correct height for any current standard US Mil. Spec. Night Vision Scopes i.e. PVS-22, PVS-24, PVS-26, PVS-27 & PVS-29. The above photo shows the MFI 14 inch long HK Low Profile Scope Mount on a PTR-91 with 30mm Tube Sniper Scope using MFI 30mm TALL Sniper Rings and PVS-22 Night Vision Scope for a perfect height match. Above is a 1.5 X 6 power 30mm diameter scope tube with MFI 30mm Standard Duty Tall Sniper Rings mounted on our MFI HK Low Profile Scope Mount. The rings are 30mm diameter. As you can see from the photo the added 8mm of height of these rings over the Medium Height allows for a greater deviation of scope types and sizes.